Zionist Union MK and former Justice Minister Tzipi Livni slams plans to normalize Havat Gilad, home of rabbi slain in terror attack. Zionist Union MK and former Justice Minister Tzipi Livni on Monday rejected a proposal submitted to the government Sunday which would include the establishment of a new Israeli town in Samaria, with full state recognition. On Sunday, Defense Minister Avigdor Liberman (Yisrael Beytenu) submitted the proposal to the coalition secretary, calling for the establishment of a new town in Samaria for the residents of the Havat Gilad outpost in Samaria, normalizing the community’s status while potentially requiring the relocation of some residents now living on disputed land. 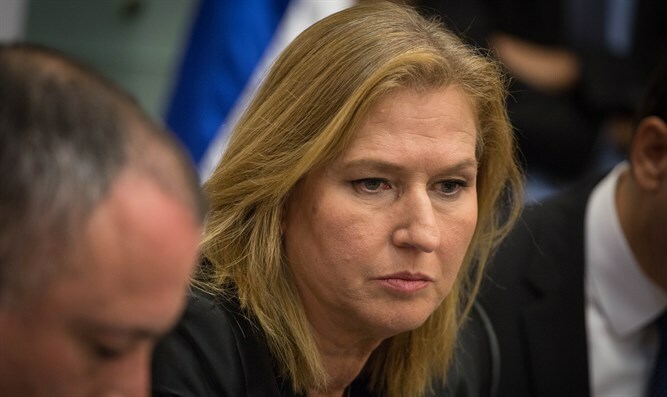 But on Monday, MK Livni expressed her opposition to Liberman’s proposal, saying that while she sympathized with Shevach’s family, last week’s murderous attack did not justify what she called a bad policy move.